A SAD DAY FOR ROMAN CATHOLICS: IT'S TIME TO FOLLOW MARTIN LUTHER, WHO FOUND THE TRUTH IN CHRIST ALONE! AMEN. Is this the Mother of Harlots that John Hus, Martin Luther, Jan Calvin, Zwingli, Hugh Latimer, John Ridley, John Bunyan, Wycliffe, Cranmer, Isaac Newton, John Wesley, Tyndale, John Newton, Jonathon Edwards, Hudson Taylor, Spurgon, F.B Meyer, D.L Moody and Charles Finney rejected and fled from! AFTER GREED & PRIDE: DECEPTION! Is this why some Prosperity preachers are forsaking the Gospel and identifying with the man who will not correct homo priests, and calls Muslims his brothers! Pope Under Fire For Telling Gay Man That "God Made You Like This"
Is the Catholic Church about to fundamentally change the way that it deals with the LGBT community? During that private conversation, the Pope reportedly told Cruz that he is gay because God made him that way and that he should be happy with who he is. 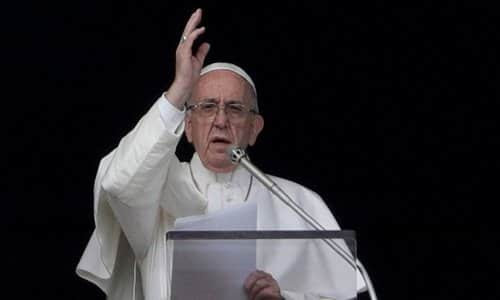 These comments by the Pope are making headlines all over the planet, and many are wondering if we are about to witness an enormous shift in direction by the largest religious institution on the entire planet. Cruz was quoted as having discussed his homosexuality with Francis. "He told me: 'Juan Carlos, I don't care about you being gay. God made you that way and loves you as you are and I don't mind. The pope loves you as you are, you have to be happy with who you are.' "
Speaking to Spanish newspaper El País, Cruz said: "He [the Pope] told me, 'Juan Carlos, that you are gay does not matter. "God made you like this and loves you like this and I don't care. "The pope loves you like this. You have to be happy with who you are." There is some difference in wording between the two translations, but the meaning is very clear in both renditions. Those comments stirred up a lot of controversy at the time, but that controversy quickly faded. But now these latest comments from the Pope have a lot of conservatives up in arms. It implies that what Catholics regarded for centuries as moral truth was wrong, or that moral truth has evolved and must be made to conform to modernity. This is moral relativism: Truth changes with the times.